The GMC Sierra 1500 was fully redesigned for 2014 and comes with more fuel-efficient engines, including a new competitive V6. The new 2014 GMC Sierra is a full-size pickup that delivers distinctive styling, a smooth ride and strong towing and hauling capacity. 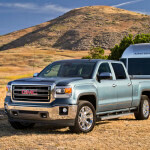 The GMC Sierra shares the same platform to the Chevrolet Silverado. The new 2014 Sierra 1500 competes on the market, besides his twin brother Chevy Silverado, with Ford F-150, RAM 1500 and Toyota Tundra. The 2014 GMC Sierra 1500 is offered in a variety of cab and cargo-bed configurations (regular cab, extended cab, crew cab, each of them with short or standard bed) and in base, SLE and SLT trim levels. The base 2014 Sierra 1500 comes standard with 17-inch steel wheels, cruise control, air conditioning, power windows and door locks, chrome bumpers and grille, cloth upholstery, a tilt steering wheel, a 40/20/40-split front bench seat and a 4-speaker sound system with a 4″ display and USB interface. The SLE adds stainless steel, LED cargo box lighting, a rearview camera, keyless entry, power and heated mirrors, a leather-wrapped steering wheel, Bluetooth connectivity, real aluminum interior trim, Driver Information Center with 4.2″ color display and Intellilink audio system (that includes 8-inch color display, satellite/HD radio, a CD player and voice controls). 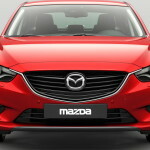 The new Mazda6 is the third generation of Mazda’s mainstream sedan and it is fully redesigned for 2014. The 2014 Mazda6 is a five-passenger four-door midsize sedan that offers a large and attractive cabin filled with upscale materials, impressive fuel economy, and Mazda’s famously sporty driving dynamics. The new Mazda6 is the second company’s car (after CX-5) designed with the Mazda’s Sky Active fuel-saving technologies. Also, as the CX-5, the Mazda6 adopts the automaker’s Kodo design language (“Soul of Motion”). 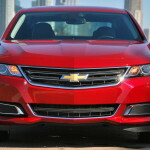 This new car competes on the market with other midsize front-wheel-drive sedan, such as Toyota Camry, Honda Accord, Nissan Altima, Kia Optima, Hyundai Sonata, Ford Fusion and Chevrolet Malibu. The new 2014 Mazda6 is offered in Sport, Touring and Grand Touring trim levels. The base Mazda6 Sport comes standard with 17-inch alloy wheels, fabric upholstery, six-way manually adjustable driver’s seat, air conditioning, a tilt-and-telescoping steering wheel, a 60/40-split rear seats, leather-wrapped steering wheel, steering-wheel mounted controls, pushbutton start, remote keyless entry, a 3.5-inch multiinformation display, trip computer and 6-speaker audio system with CD player and iPod/USB interface. When equipped with the automatic transmission, the Sport model also includes a 5.8-touchscreen, Bluetooth connectivity and a rearview camera. The Touring trim adds 19-inch alloy wheels, 6-way power driver’s seat, dual-zone automatic climate control, leatherette upholstery, blind spot monitoring, center console sliding armrest and cross-trafic alert. The Touring Technology package adds keyless ignition, keyless entry, rain sensing wipers, automatic headlights, auto-dimming rearview mirror, heated side mirrors, navigation system and 11-speaker Bose sound system.